We make cost effective custom screens to keep out large particulates so that your Air Handler unit will run more efficiently. 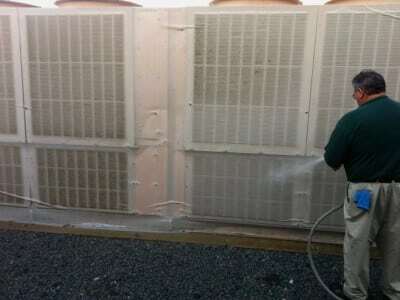 With our pre-screens, you will save on expensive air handler filter replacements and save on servicing frequency. Our HVAC screens are externally mounted so that visual inspections are easy. Our screens are custom-made and sized to your specifications. All Chiller screens are bound with a sturdy webbing around the entire perimeter. Fasten our air handler screens with a combination of Velcro® and stainless steel marine snaps. When it gets dirty, rinse with a hose or wash in a machine. It is that easy! Panels include all fasteners and easily installs with a screw driver. We have provided screening and filter solutions for a wide variety of interesting applications over 10yrs. We have BIG netting fabric and we know how to rig it. If you think about netting, it is a type of filter. Some things you want to block and other things you want to let pass through like air flow or sunlight. Our netting is super tough and has been used as scaffold netting to keep people below from getting bonked on the head by falling debris or perhaps a dropped hammer. We've made tank hatch covers for the Marines to allow air flow in on a hot day but to keep some jack wagon from tossing in a grenade. Think filter and we can probably help! Click on the middle picture that will show a warehouse curtain 38ft tall and 500ft wide.